Call Casino Party Planners at 317-857-0168 for your next casino party event or fundraiser and reserve your casino equipment today. We have lots of rentals for your casino party including craps tables, blackjack tables, poker tables, roulette tables and much more casino equipment available. Check out our “Party Extras” page to see all of our décor and specialty items that can really make your next event spectacular. And of course, our Casino Equipment and rentals can be staffed by our dedicated professional team of dealers who will provide your guests with an experience to remember. You can make this more than just an event, we can make it a memory! The table top is a Digitally printed Synthetic felt that is identical to what Casinos actually use. Underneath the felt is open-core foam that prevents liquid from being absorbed into the material. Spills can be easily and quickly cleaned up. 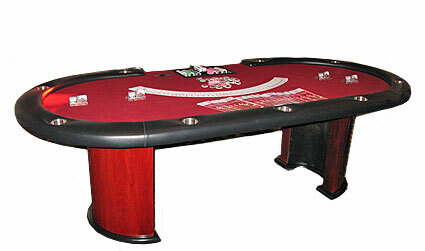 The table top also features a padded rail to give the dealer and players the highest comfort level. In addition, jumbo Stainless Steel deep set cup holders accompany each table so every player has an easily accessible place to put their drink. The table also features ½ moon curved wooden support bases. You would never see a table skirting or metal folding legs in a real casino! These give the look and feel of the real thing! All of our Poker Tables are 98” inches and are the same size and style of equipment that is used in casino poker rooms around the world. It is also the same size as the one used on the Travel Channel and ESPN for their televised Texas Hold'em Poker tournaments! This is a Full Size Blackjack Table identical in almost every way to what you would find in almost any casino throughout the world. Each table can accommodate up to 7 Player Positions plus the Dealer. Each table features Wooden curved ¼ moon arched Legs and a Wood Reinforced Exterior Frame - Size 76”W x 36”H x 48" deep along with black vinyl padded armrests for the players comfort. The table top is a Digitally printed Synthetic felt that is identical to what Casinos actually use. Underneath the felt is open-core foam that prevents liquid from being absorbed into the material. Spills can be easily and quickly cleaned up. In addition, jumbo Stainless Steel deep set cup holders accompany each table so every player has an easily accessible place to put their drink. "Accommodates up to 7 players comfortably." Shooter coming out! Our Craps tables rentals come in three sizes, 8 foot, 10 foot, and 12 foot. They are all high level professional casino grade. Each table is made out of Birch or Oak wood and has a carved double row inset wooden chip tray for each individual player along with a drink rail and a thick padded arm rest for comfort. Tables felts are all digitally printed synthetic so the surface is perfectly smooth. This is identical in almost every way to what an actual casino would use. The playfields are all solid and smooth which means no cracks or lines in the underlying wood that might affect the way the dice roll. If you haven’t guessed by now, we take craps very seriously! This game is the most fun in the casino and makes more money for the players than any other game there is! "8 foot table accommodates up to 12 players comfortably." Our Roulette tables are all FULL SIZE and are identical in almost every way to what you will find on an actual casino floor. Our tables are manufactured by the same company that makes them for many of the casinos. All of our Roulette tables come with a REAL 32” Roulette Wheel. Every one of our wheels is the real deal and has been used in either an actual casino or a river boat. Millions of dollars have been won and lost on each wheel we feature. Each table comes equipped for a professional game setting and includes all equipment necessary for an amazing event full of fun and excitement. Each table features a comfortable armrest with padding for added comfort along with jumbo deep set cup holders for your guests to place to their drinks in while the action is heating up. The table is made of beautiful dark cherry wood and is supported by wooden support bases just like the casino would have. No skirting or metal folding legs here! This table is absolutely beautiful and can really make your party come alive. Each table felt is digitally printed synthetic felt just like the casinos use, which means spills can be cleaned up in seconds and never affect game play. "Accommodates up to 8 players comfortably." This is a Full Size Let it Ride Table identical in almost every way to what you would find in almost any casino throughout the world. Each table can accommodate up to 7 Player Positions plus the Dealer. Each table features Wooden curved ¼ moon arched Legs and a Wood Reinforced Exterior Frame - Size 76”W x 36”H x 48" deep along with black vinyl padded armrests for the players comfort. If you know the basics of five-card stud poker, you'll fit right in at the Caribbean Stud Poker table. Just remember that you're playing against the Dealer, not the other Players, so you don't have to worry about figuring out everyone else's strategy. This is a Full Size Caribbean Stud Table identical in almost every way to what you would find in almost any casino throughout the world. Each table can accommodate up to 7 Player Positions plus the Dealer. Each table features Wooden curved ¼ moon arched Legs and a Wood Reinforced Exterior Frame - Size 76”W x 36”H x 48" deep along with black vinyl padded armrests for the players comfort. Three Card Poker can be one of the most exciting and exhilarating table games around. There’s always that anticipation when the next hand is dealt, as a huge payout might just be three cards away, and there’s no telling when that next straight flush is coming. This is a Full Size Three Card Poker Table identical in almost every way to what you would find in almost any casino throughout the world. Each table can accommodate up to 7 Player Positions plus the Dealer. Each table features Wooden curved ¼ moon arched Legs and a Wood Reinforced Exterior Frame - Size 76”W x 36”H x 48" deep along with black vinyl padded armrests for the players comfort. This beautiful wheel is completely CUSTOMIZABLE in virtually every way you can imagine. Round and round she goes, where she’ll stop, nobody knows! The centerpiece of almost any casino party event, this giant wheel captures the imagination and curiosity of everyone that sees it. The bright LED lights create various patterns as the wheel spins around towards its final destination.